Skunkboy Blog: Giveaway: Studio M.M.E. Megan Eckman is the illustrator behind Studio MME. 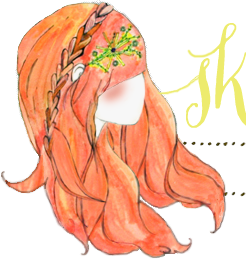 She is getting ready to release a new series of embroidery patterns based on her illustrations, and she is generous enough to give one away to a lucky reader! I have been embroidering for two years. I love it, best way to end my day with a mug of tea. i have been embroidering since i was a little girl. love it, don't do it nearly enough! I just completed my first project. I considered it my "practice piece." Took about three months for me to complete. Now I'm looking for my next project! I've never really tried embroidering, but I've always wanted to. I LOVE the picture of the girl with the deer! I love Megan's work! I've been eyeing her illustrations for ages. I have been dabbling with embroidery for a few years, but my techniques are very basic! How nice it would be to have this as inspiration. I started embroidering about 9 months ago - still learning. I love the craft - such creative ideas! I've only tried embroidering a few times and I don't think i'd ever be that good! I've just started learning. Wish I could be half as good as her, haha. I haven't embroidered since middle school, but this would be just the inspiration to bring me back to it! I've only been embroidering for a few years, so I'm still developing a talent for it. Love these patterns!! I learned to embroider when I was a little kid, and I took it back up again about a year ago. I'm currently working on embroidering the bookcloth for my wedding guest book. Megan Eckman's illustrations are so lovely and will make beautiful embroidery patterns! I've been embroidering since I can remember! Probably about 4th grade. I'm 34 now. Has always been something to help me unwind. I plan to teach my little girl when she seems old enough to handle a needle! I learned how to embroider when I was 10. Unfortunately, I haven't kept it up. But I'd love to win it for my sister, for whom embroidery is her favorite pastime. I've only recently started dabbling in embroidery and I am falling harder and harder each time. It is actually a small part of a gift project I am working on for a friends' bridal shower gift! I took a class a couple years ago from a great teacher @ Stitch lab here in Austin, and have been embroidering ever since! 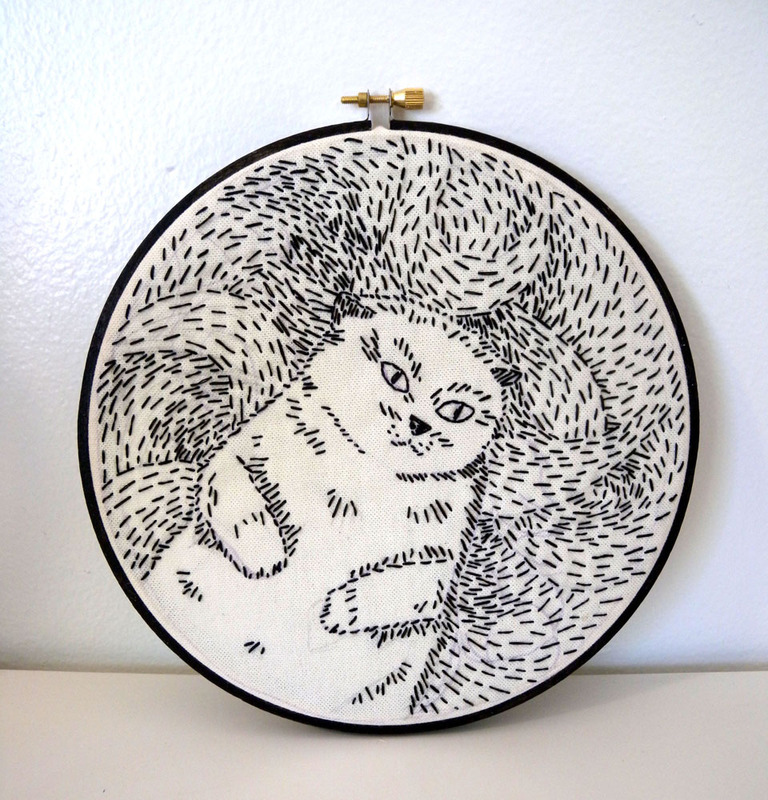 These illustrations look amazing embroidered! Oh my gosh! I was just drooling over her work this morning! I've been embroidering for about a year now! Fingers crossed for this amazing giveaway! I have never embroidered, but now I am rather inspired to give it a try! I really love the first piece. So moody, and green is my favorite color so I'm always partial to that. i have only tried embroidering once, but now i want to try it! and i am in love with the girl and deer one! These are awesome! I've actually never tried embroidery, but I've been wanting to for a long time. i've been embroidering as long as i can remember. but easily the last 10 years. but i've only started doing it heavily within the last year. Wow, these are stunning! I've embroidered a few little designs in the past year with the Doodle Stitching series. how sweet is the deer pattern?! my grandmother taught me how to embroider as a little girl, due to university and other commitments i haven't practiced in some time, though i have made a conscious decision to get back into it as soon as possible!! I have been embroidering since I have been 8 :) And well that is a long time ago since I am 53! lol thanks - love the patterns! I've done embroidery since I was a little girl- starting almost 30 years ago. I love the pattern with the girl. How awesome are those?! I've been embroidering off and on since I was a little girl. Beautiful! I've been embroidering for about 4 years now. Oh how lovely are they?!! I've been embroidering for about 2 years. Since I found knitting, embroidery has strayed from my radar a little but seeing these cute pieces has inspired me to get back into it! I haven't ever tried to embroider but those pictures make me want to start!! They are amazing! I've only done miscellaneous embroidery for fun, but I've done it since I was a kid! My grandmother taught me how to sew when I was in middle school (and now I'm almost graduating college!) so it's been a long journey! Embroiding is on my list. First im trying sewing and knitting! Love being creative! Ooooo, I am so excited I was just drooling over these last night and was even more excited when I logged on here to find the give away. I have been "fawning" over "Coming Home" :p I have been embroidering since middle school and that was quite some time ago. What lovely pictures and designs! I've been embroidering since I was young. My mom taught me and my little sister all sorts of crafty mediums and the stitchery and crocheting stuck with me. The last thing I embroidered was a picture of my two cockatiels, Elvis and Stella. is it okay to enter this even though i don't embroider? i use embroidery hoops to make "hoop art" using vintage map paper though! I haven't embroidered anything worth showing, just yet anyways! These pieces are such great inspiration though. I would be thrilled to own either! Thank you both for the give away!!! oh these are fabulous! i have been embroidering on and off since the ancient days when i first learned at 8 years old, which was in 1979! I have never embroidered but this is absolutely lovely and I would definitely learn to make this! They're gorgeous. I'm not an embroiderer but it's certainly on my to-do list. Oh my goodness, the deer one is adorable! I have been setting myself up to begin embroidering, my sister's grandmother is going to give me lessons. I've been embroidering for as long as I can remember! My grandmother used to sit me down with a needle and thread to keep me still while she knitted. I used to make little squiggly people with misshapen heads and odd looking faces. I'm much better at it now tho! I incorporate painting on fabric as well as embroidering it! I adore this! I've have embroidered ever since I was a little girl. In the last 3 years I have gotten more serious. i have never embroidered before but my grandmother does.. I embroidered something in school...once! 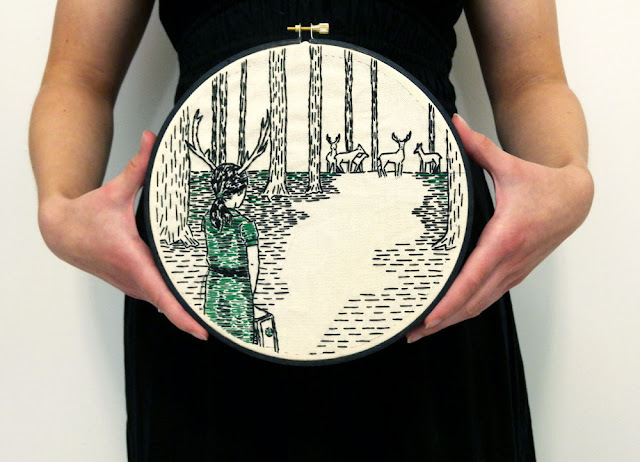 Embroidery is beautiful, I'm just not so good with my hands...the girl with her antlers is mesmerising. My grandma taught me to embroider when I was younger but I no longer do so. it was fun though! I started with cross stitching in 6th grade, and have been embroidering for the last 11 years! I've only done much embroidering at a summer camp I was a counselor at - an old fashioned crafts camp for elementary school kids. It was a lovely time, and I miss being there! My grandmother taught me to embroider 7 years ago when i was 13, I brought all of my needles and thread with me to college! I embroidered as a young girl and have been wanting to re-learn it. These are so fun! I don't embroider....YET!! Can't wait to start and this would be an awesome project to do it with! To be honest I've never tried my hand at embroidery, although my mother/grandmother/aunts/sister all do it and I've always been curious about it. I'd love to learn, though! Oh my goodness, I have been embroidering for YEARS. This post made me think back and realize that it's probably been 15 or 20 since I first picked up an embroidery hoop - eek! These patterns look like they will be fantastic. I remember embroidering as a kid, but just picked it up again a couple of years ago. I've been embroidering you a year! Oh, how lovely!! I started embroidering probably 3 years ago? I instantly fell in love - perhaps it had root in my 12 year old self's cross-stitch habit? :) My fingers are crossed! Embroidering is on my list of crafts I want to try by next summer! It sounds time-consuming but I have seen such amazing artwork (including these ones) that I can see it's really worth taking it up as a hobby! i love embroidery. i've been doing it consistently for the past 4 years now. though, i started when i was 5 years old - my mom taught me everything i know. good luck everyone! I haven't started embroidering yet, but I'm trying to convince my roommate to teach me! I've never really embroidered before, but I really want to learn! Megan's patterns are amazing! I remember my Grandma teaching me french knots when I was about 6. I loved sewing, embroidering, and crafting with her. I've been doing it ever since. These patterns are so sweet! I haven't done much embroidery since college, but I've got a hoop swap coming up to refresh my skill set. Thanks for the chance to win! I've been working on a piece whenever I find spare time for the last several months but I would love to start embroidering more! I just started embroidery last week actually! I decided it would be nice if I could make vintage, flour sack towels with funny 1950's twist for my best friends' wedding later this fall. So far it has been a frustrating process. I sure hope she like them! I started embroidering at age 12 or 13. I had stopped when I needed cataract surgery, and happily, I am embroidering again! I've never embroidered, but i want to learn! Lovely! I just started embroidering in the last few weeks and am looking forward to making some Christmas presents this year. I've been embroidering since I was a little girl, but have only recently found interest in it! Before, it was just a thing mom made me do! I started embroidering 50+ years ago. Tried counted thread for a while and have returned to printed patterns.It can be hard these days to find patterns with a bit of sophistication, so I'm really looking forward to seeing Megan's new line! Very promising! My mother taught me to embroider when I was a child, but until the beginning of this year, I only used to cross stitch. I started embroidering 3 years ago and it was the first thing I could do. Than I learned cross-stitching and after that I started sewing and crocheting. But I never made something so special like the these!! This is a grat giveaway! I have been embroidering ever since I was little, my first finished thing being a picture of Mr Blobby! Cute!! I don't know how long I've been embroidering, but my grandma taught my sister and I embroidering, cross stitch, and knitting in the summer holidays. Great memories. I've been doing basic embroidery for about a year. I have yet to take on a project as detailed as the pieces above, but I'd love to try! I've been embroidering for about 5 yrs, ever since my co-worker gave me the most beautiful wooden case filled with an array of rainbow of thread! So, so, so pretty! One of these must live on my wall, and SOON! Don't laugh, but I have been embroidering for about 14 months now, the problem is, it's still the same piece..... I think I aimed a little high for my first :) No matter - I love it, and Megan's work blows my mind! I did it a lot when I was a little girl. My grandma teached me how to do it. I just loved it. Now I don't have enough time to do it, sadly. I have never embroidered, but I just purchased a bunch of supplies to start my soon to be obsession. Would love to win one of her patterns! I've been collecting embroidery patterns for a few years, but only just got around to starting the actual act of embroidering! I think embroidered pieces are so beautiful, and these patterns are stunning! Thanks so much for the chance to win. So I just settle with buying beautiful embroidery from people who do have that talent! Embroidery is on my crafts to learn list! I discovered Megan's work a few weeks ago and love her illustrations. She has translated them so well into embroidery! i learned to embroider in brownie scouts when i was 7 years old! so that means i've been doing it for 19 years!. hmmmm, i should probably be better at it. what!? love those illustrations! i started embroidery 5 years ago while pregnant on a trip to mexico-loved it then, love it now! thanks for the giveaway chance-i'd love to tackle one of those babies! I've only embroidered names on Christmas stockings and a few eyes on sad little plush projects. It is so thereapeautic though, I should again try soon! I've been embroidering for about 2 or 3 years which makes me sound experienced but I'm really not. I am quite the novice and would love to create something that I could be proud of! I have only really started embroidering, not long after Christmas! This is such a great giveaway! I'm just starting out, I've done a few cross stick patterns in the past but I do love embroidery, it is beautiful! ^______^ I started to embroider only a few months ago and is very relaxing to me! The edges of this illustrator are cute! I've been doing it (embroidery, that is:) for about three years. Thanks for the giveaway! Even though I've only been embroidering for a little while, I love it! And the patterns are adorable! I used to embroider when I was nine years old (eleven years ago!) but I'm going to pick it up very soon! My Mom taught me how to embroider about 15 years ago (when I was 10). I'd have to say it's my favorite hobby! If I don't win, I'm going to have to buy some patterns, they are lovely! I just started embroidering this year. Never realized how fun it was! I've only tried a handful of times in the past year but I would love to keep on learning and improving! I've just started embroidering. I only know one stitch! I'd love to learn more and these patterns would be just the ticket. oh my goodness, these are stunning!! i've been embroidering (here and there) for a few years now. i haven't been so inspired by something embroidered maybe ever, i just love these so much! I've been wanting to learn how to embroider for quite a while now!!! Those patterns are darling! This would be the perfect opportunity to learn. My mom taught me several years ago when our family was evacuated for a hurricane. Cross stitching always brings up those memories of spending time with my mom, learning something she loves dearly. These are precious! What a great giveaway! I've been embroidering for a while and it is so much fun! I've embroidered on and off over the past several years, but the creative bug is attacking full force right now so hopefully I can jump back on the bandwagon for good! When I was a little kid I got those easy-to-make embroidery kits for children from my grandmother. I really loved playing with it! Unfortunately I lost track of it when I grew older. But lately I'm into crafting again, finally.